In this Fast & Furious age of public discourse, last week’s focus of political drama is already ancient history. Before my pixels are dry, Trump or his minions will doubtless have pulled out a new shiny object for everyone to gape at, complete with hyperventilation by Sean Hannity. Self-care requires occasionally setting our own pace, as when I skipped watching the State of the Union in favor of a good book. The president’s vocal delivery reminds me of my nieces imitating bored Valley Girls. We can remain vigilant without being masochists. The fact that more volleys of deflection and distraction are certain to follow after the flop of the House Intelligence Committee’s overhyped “secret memo” last week should give alert citizens sufficient pause to learn lessons. One is this: If the assault on federal intelligence and law enforcement agencies by congressional Republicans on behalf of Trump is not treason, we should apologize to Benedict Arnold. It is easy to be dismissive, such as by counting the incompetents on Trump’s team. Rep. Devin Nunes’s dubious hackwork occurs in a season when zealous numbskulls are popping up like crocuses that Republicans forgot they planted. However, it should be noted that Nunes has been backed by Speaker Ryan. His mendacious, self-contradictory hit job on the FBI and DOJ, to which he promised sequels, feeds the noise-generating machine that helps the president obstruct justice. Perhaps the president’s lawyers will persuade him not to reprise President Nixon’s Saturday Night Massacre of October 1973, in which the top two officials at Justice resigned rather than fire Watergate Special Prosecutor Archibald Cox. But Trump is ignorant, headstrong, and convinced he is a law unto himself. And he is politically clever. His trash talk sells, as in the prelude to a WWE wrestling match. The destructiveness of his zero-sum politics does not matter to his rabble. Part of what blinds us to our situation is the media’s moral equivalence and its focus on the play-by-play of the game (a metaphor it hardens into reality) rather than the stakes. Andrew Sullivan in New York Magazine dismissed Rep. Joe Kennedy’s SOTU response as mere rote recitation by a rival tribe, despite its appeal to a broad spectrum of people based on foundational American values. Seeking equality for all is not a tribalist enterprise. Sullivan lumped Kennedy in with Hillary Clinton based on the conservative shibboleth of “identity politics,” a trigger term that shuts down thought in those who refuse to recognize that people organize in identity groups because discrimination leaves them no choice. He dismissed Kennedy’s criticism of Trump’s racist immigration policies just a week after he dismissed intersectionality, which is simply about dealing with our inescapable diversity. A sign of the futility of arguing with some people is how conservative wags ignored Democrats’ inspired choice of a 37-year-old for the response to Trump instead of another septuagenarian, and suggested that the glisten on his lip was from drool rather than lights reflecting on his Chapstick. Still, Kennedy has the youth, warmth, and ability to connect that Clinton lacked. “However,” as Prince Faisal notes in Lawrence of Arabia, “before the gardens must come the fighting.” Do we have the endurance and resolve to see this through? Trump is accompanied everywhere he goes by a military aide carrying the nuclear launch codes. Before November’s midterm elections as well as after, a lot of damage can be done that neither street protests nor all the trolls’ LOLs can undo. The first job of the resistance is to resist overconfidence. I notice that under the new tax law, my federal income tax deduction was lower this month, which is lucky in case the current spasm of revolution by multipart tweets fails to recapitulate Lenin’s arrival at Finland Station. As FBI Director Christopher Wray said in a message to employees after the release of the Nunes memo, “Talk is cheap; the work you do is what will endure… Remember: keep calm and tackle hard.” It is advice we would all do well to follow, as Special Counsel Robert Mueller’s investigation into Russiagate continues. As if anything produced by Nunes favoring Trump could have an iota of credibility! He’s one of the most blatant partisan hacks of all time! Zero integrity and one of Trump’s puppets! Meanwhile, several of His Republican colleagues are disavowing any connection between the memo and the Mueller investigation, contrary to what Trump and his advisor Hannity are saying. But if they are serious about that, they should demand that Speaker Ryan remove Nunes as Intel Committee chair, and support bipartisan legislation to shield the Special Counsel from presidential interference. They are caught between their panic over the recklessness of Nunes and Trump and their fear of Trump’s base. Trump will win this fight and in 2020 too. Americans love our great leader! Meanwhile, those conservative and right-wing judges keep getting appointed to the courts at an incredible rate! Can’t stop the Trump train now! Yes we can stop it. We might fail, as I myself point out. But it’s absurd to say it’s impossible. One small bit of news: the Supreme Court has refused to take the PA gerrymandering case, which is bad news for that state’s GOP. Who is “we”. All of my circle of gay friends are loving Trump and their HUGE tax breaks! Now “we” just want to see him build the freakin wall! Trump will definitely be the greatest Prez since Ronald Reagan. Mark my words! WE is the GLBT majority! You’re a minority within a minority despite your delusions of grandeur! If you want the wall, then have the Koch Brothers use the $400 Million they are earmarking to buy the mid-term elections and use it for that. Then you Fake POTUS supporters, the Mercers and the Trump can pay the balance then send the bill directly to Mexico for reimburesment! That’s a joke! Like gay men voting in podunk wear big lavender ribbons when they go to the polls! You have no conclusive data on the voting habits of gays! Stop your deception now! You’re a bad joke! You have no proof to the contrary so stop exaggerating your value and your numbers! You have no evidence at all! You’re a whiff of bad breath leftism. You need to gargle it away loser! You’re a whiff of bad rear end right-wing gas! Jump into the bowl so we can flush you down! You’re the biggest loser Charlie Brown! You’re such a sad sack political commentator! Just like your love life! Tired! You’re such a pathetic political hack! When it comes to the garden of love, you’re definitely a prune that is as sour as a lemon! You just rot on the vine as the only thing people want to pluck on your is your uni brow! Your garden of love is constantly in need of antibiotics! While yours is a forest of weeds infested by bugs…crabs most likely! Please stop responding to him. This exchange has become ridiculous. Really, what is more ridiculous than invoking Leftist “Identity Politics” as a positive thing? There is a reason that Dr. Jordon Peterson is #1 on the Amazon Best Sellers list right now. Heard of him? Your comments show a complete tone deafness to the political realities sweeping the Western world right now. Not surprising for someone who lives in the DC bubble. Considering that on March 4 Italians are poised to elect LEGA (Northern Front) as the leaders of a coalition government with Casa Pound, The Brothers of Italy and Berlusconi’s crowd; I would say there is a new wind blowing through the house in the West. I guess its wise to shut down a conversation when you have nothing to say in defense of your position! Let’s face the facts. Marxism is dead and rebranding it as Identity Politics worked for 50 years, but its days are ending fast! You are not paying attention to what I say except at the most superficial level of reacting to trigger words. Marxism? That is just bizarrely off-base. Attacking people for “identity politics” (a term invented by conservatives and white supremacists to dismiss liberals but never applied to their own identity politics) is just blaming them for defending themselves. In any case, my beliefs are not Marxist at all. Really? You see no connection between identity politics and marxism? Are you kidding me or just unaware? Honestly, I can’t believe you just made that comment. Let’s look at the greatest evil of the 20th century that we all cannot deny….Marxism. I would suggest you research the Frankfurt School of Philosophy and the origins of “Critical Theory”. It’s common knowledge that identity politics is just Marxism given a makeover in the 1960’s- 70’s. Identity Politics is so evil because it doesn’t value the individual and sees everything through the association of the group. How many tens of millions died at the hands of idealogical Marxist monsters? We’ll never know the full extent of the suffering. Marxists (cultural and economic) are absolutely no different than Fascists, Nazis, Rexists, Ustasha and the list goes on. The individual has no worth at all and life is cheap. Just the flip side of the same coin. Identity politics is simply a “Trojan Horse” being used by Fabian Socialists to degrade Western institutions from within. The gig is up now with Trump! 1. Trump is freeing business and commerce from intrusive and stifling regulation to jump start the economy. 2. He plans to bolster our military and modernize its equipment and give veterans the top notch benefits they deserve. I can’t wait for the parade! 3. Trump will build a wall on our southern border and bring our country back to the rule of law with regards to immigration. End “Sanctuary Cities” too. 4. Trump is appointing common sense conservatives, at record rates, to ALL levels of the courts to bring the judicial system back to judicial realism. 5. Trump will investigate and prosecute the corrupted political system and drain the swamp of the sleaze we now call our political system. 6. Trump will honor and support the USA’s true allies in the world, exemplified by his support of moving the US embassy to Israel’s capita, Jerusalem. Supporters of Trump know EXACTLY why we voted for him and Trump is delivering. You can cry foul and invoke identity politics ad nauseam with all the other Democrats! We all saw how it worked out in 2016. BTW – I’m an Ex-Democrat and now an Independent. I could no longer support a party that appoints the likes of Larry Ellison (a former spokesman for Louis Farrakhan for 11 years) to prominence. Loved that smiling pic of Obama with Louis Farrakhan too! Sickening. Louis Farrakhan – the man who called Adolph Hitler “a great leader”. The biggest anti-semite and homophobe of them all. No big deal for you? Really? No thanks – I’ll stick with Trump. He isn’t perfect but doesn’t hang out with folks from the Nation of Islam like the Democrats do these days. Oh – BTW The term “identity politics” was not invented by right-wingers…that’s a completely false statement. I used to live in San Francisco 20 years ago and had friends who had shows on Pacifica Radio in Berkeley. They used the term “identity politics’ at the studio frequently to describe the ideas surrounding their beliefs about society. Be very careful about the rhetorical nonsense you put forth. Like the author David Horowitz, I formerly traveled in the most “progressive” (and I use that term jokingly) in the country. You can’t fool me with Lefty BS….I was a “Red Diaper” baby. Hide in your echo chamber if you like. There is a long list of issues besides taxes, and a mountain of evidence of Trump’s recklessness (which I’ve written about over many months), but just on taxes, we’re already seeing signs of the resulting deficit. Echo chamber? New polls show Trump’s approval ratings shooting up to 50%! Similar to Ronald Reagan in 1980-1982, Trump is going from being hated to being revered in short order. All of the tired, old Identity Politics being pushed by the Democratic Party (and its minions) will be no match for a robust economy and rising wages for working people. Not to mention, the trillion dollar infrastructure program Trump advocates to rejuvenate our transportation sector. How brilliant can Trump be to propose this? SHEER GENIUS! Just like Bill Clinton said in 1991, ‘It’s the economy, stupid!’. Democrats will become even more irrelevant than they are now! “Russia! Russia! Russia!” will go down in history as the biggest “Nothing Burger” ever concocted by DC PR firms! Donald Trump! An American Hero! You mean like you told us Democrats can’t win elections anymore….Meanwhile in States like Virginia we have a Democratic Governor and in Alabama a Democratic Senator despite Trump’s endorsement for the Republican!!!! Your glass house is cracking Marie! 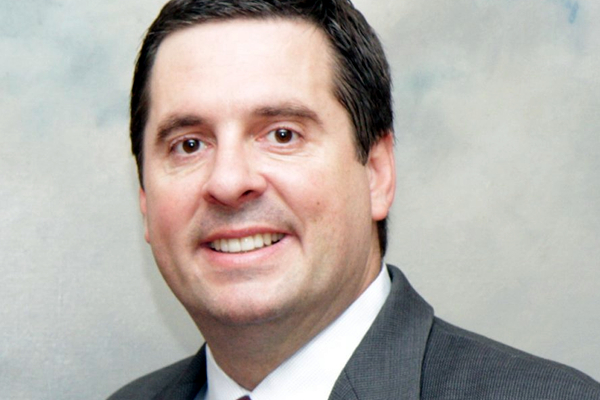 Nunes would likely lick Trump’s boots if he told him to since he’s already got his nose so brown!